Guard booths provide an important layer of security and protection for the perimeter of your facility. A guard shack provides a secure and contained area where your security team can monitor perimeter activity or simply provide access control to ensure that unwanted visitors are unable to enter your facility. There are many types of facilities which can benefit from the addition of a prefabricated guard booth and in today’s blog, we offer some insight and advice into how a guard booth can make different types of facilities safer and more secure. 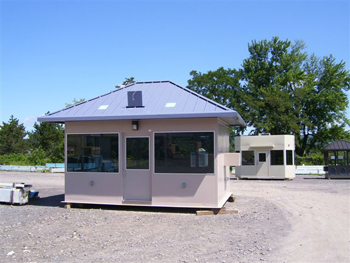 Many different types of facilities can benefit from the addition of a guard booth. The addition of a guard booth at the entrance to a state park or other outdoor recreational area offers many benefits. First, it provides a central location where visitors can go for information such as maps. Second, if the park requires an admission fee, the guard booth provides an easy way to control access so that only paying visitors are allowed to gain entrance. Because guard booths can be outfitted with full HVAC systems, they can provide comfort to your employees no matter the weather. When you have product or goods that are being kept in a specific location, you want to be sure that the location is secure. While security systems provide some level of protection, guards on foot patrol are one of the best deterrents to keep thieves at bay. A guard booth provides a location for security teams to be headquartered and can also be outfitted with video surveillance monitors so personnel can keep an eye on other areas of the facility. It also aids as a place for deliveries to check in so they can be routed to the proper area. With the heightened security that has become so prevalent in today’s world, most government facilities, whether it be an office building, museum, military base, etc., can benefit from a guard booth. A prefabricated guard booth offers control and a location to monitor the ins and outs of the facility. This entry was posted on Thursday, March 17th, 2016	at 11:40 am	. You can follow any responses to this entry through the RSS 2.0	feed. Both comments and pings are currently closed.